Africa Leaders’ Summit Workshop - “Driving Investment in Power Africa"
General Counsel Kelly Welsh traveled to Beijing and Wuhan, China, the week of January 12 to discuss how the United States and China can work together to promote commercial rule of law. President Obama and Secretary Pritzker have repeatedly emphasized the importance of a commitment to a strong rule of law for promoting economic growth. General Counsel Welsh bolstered the U.S.-China dialogue by spending time with academics, legal professionals, the media, Chinese government officials, and U.S. business leaders. In a speech at the Beijing American Center, General Counsel Welsh spoke to a large audience about the importance of a transparent, accountable, and predictable commercial legal system. During my experience as a senior executive and general counsel for U.S. companies, I saw the link between a strong commercial rule of law and economic growth first hand. When deciding which countries to invest in, or to market our services in, the strength of a country’s rule of law was always a critical factor in our company’s decision-making. 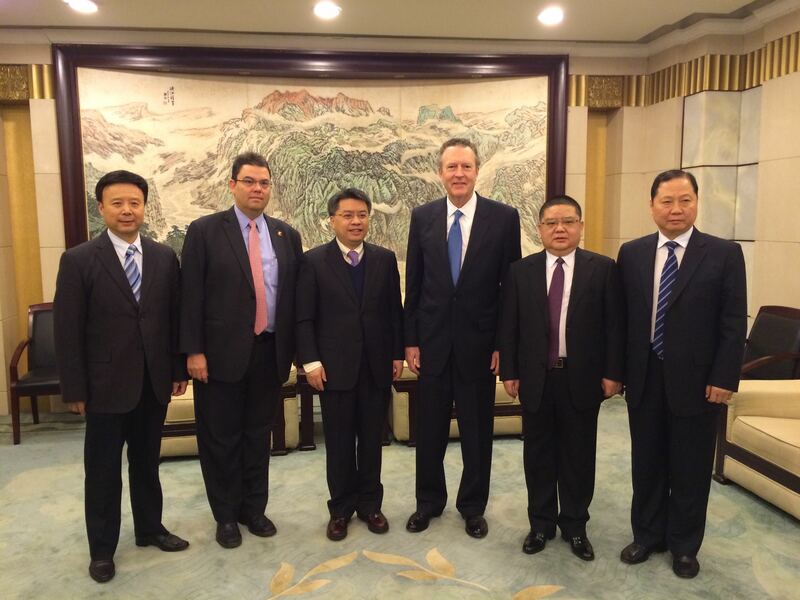 General Counsel Welsh led the U.S. delegation for the 19th U.S.-China Legal Exchange, a longstanding public dialogue with China’s Ministry of Commerce under the Joint Commission on Commerce and Trade (JCCT) Commercial Law Working Group. Experts from the U.S. Environmental Protection Agency, the National Institute of Standards and Technology (an agency of the Department of Commerce), the Federal Trade Commission, and the private sector, presented to large public audiences at Tsinghua University and Wuhan University on topics of key concern to both the United States and China: U.S. laws and policies on air pollution, and commercial cybersecurity and data privacy. The General Counsel also met with Chinese government officials to discuss the U.S. approach to cybersecurity, including the NIST Cybersecurity Framework, and to urge China to enforce its laws criminalizing bribery of foreign public officials, to ensure that all companies compete on a level playing field throughout the world. The General Counsel’s trip highlights the importance for Secretary Pritzker and the Department of Commerce of promoting strong commercial rule of law wherever U.S. companies do business. By promoting a strong rule of law, the United States and China can work together to create a global business climate that fosters growth and innovation. The recently published “Understanding Power Purchase Agreements” handbook was highlighted as a major achievement of President Obama’s Power Africa initiative during the Power Africa Private Sector Partners Meeting on January 28 in Washington, DC. Power Africa is an initiative to increase the number of people with access to power in sub-Saharan Africa. At the Private Sector Partners Meeting, USAID Administrator Rajiv Shah and Power Africa Coordinator Andy Herscowitz noted the important role the handbook will play in promoting power projects. The handbook — produced through a partnership between the Office of General Counsel’s Commercial Law Development Program and the African Legal Support Facility — features over a dozen leading power project contract experts from the US Government, African Governments, banks, development finance institutions, developers and law firms. The best practices guide is intended to provide a common understanding of the most important terms in Power Purchase Agreements, which are at the core of most privately-financed power projects. The book is available for download on the Commercial Law Development Program’s website.